“Mr. Robot” is getting two extra episodes. 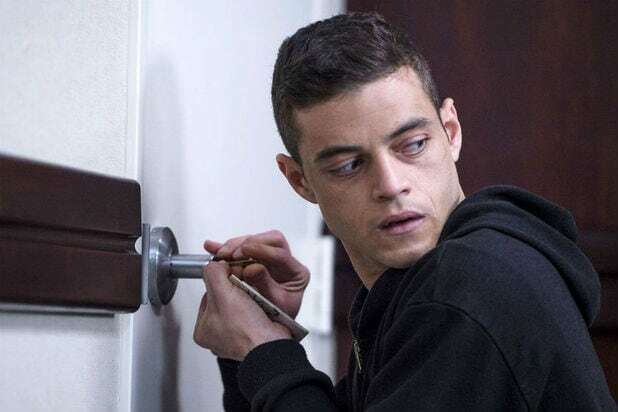 USA announced Thursday that the second season of the Rami Malek-led drama will consist of 12 episodes, rather than the previously announced 10. Show creator and showrunner Sam Esmail will direct all 12 episodes. Additionally, the network has ordered a live after-show, “Hacking Robot,” which will air after back-to-back season premiere episodes on Wednesday, July 13. “Hacking Robot,” which will feature a behind-the-scenes look at the show, is only scheduled for a post-premiere airing for now. No host has been announced yet. Season 2 of “Mr. Robot” sees (Malek) Elliot and fsociety’s continued attempts to use their hacking skills to bring down the wealthy and corrupt corporations ruling America from the shadows, and this time, even President Obama gets wind of the dire situations at hand. The award-winning drama hails from Esmail as well as Anonymous Content executive producers Steve Golin and Chad Hamilton, and is produced by Universal Cable Productions. The back-to-back season premiere episodes of “Mr. Robot” will air with limited commercial interruptions and premiere at 10 p.m. ET on Wednesday, July 13 on USA. The former YouTube star sang and danced her way to being one of the most successful transitions from social media to become The CW's latest star. A Golden Globe nomination later, and Bloom's breakout status was cemented. Nobody knew if Marvel's Netflix franchise dreams would work, but Cox's blind superhero Matt Murdoch was quickly embraced by fans. It didn't hurt that "Daredevil" was dark, gritty and quickly put a stamp on what type of quality Netflix and Marvel would be churning out for this new universe. Superman's cousin is quite iconic herself, and the first female-led superhero series since Lynda Carter's "Wonder Woman" needed someone with real star power. Luckily, Benoist embodied the goodness and hopefulness of Kara Zo-El effortlessly, and was readily embraced by picky comic book fans. Having made a career out of playing loud and obnoxious characters, Ansari took a subtle yet distinctive turn in his first leading role, lending warmth and heart to Netflix's latest breakout hit. Shanice Williams, "The Wiz Live"
A nationwide open call for the leading role in a live musical event could have yielded a disaster, but newcomer Williams turned out to be anything but, holding her own against legends like Queen Latifah and Mary J. Blige, and making an undeniable case for why she should have a long career ahead of her. The hacker thriller may signal a new direction for USA Network, but fans know it mostly for the riveting performance of Malik, who at last found a leading role that allowed him to shine after praise-worthy supporting roles. Alycia Debnam-Carey, "Fear the Walking Dead," "The 100"
First she ruled over a post-apocalyptic society on The CW, then she encountered the very beginnings of a zombie apocalypse on AMC -- collecting hordes of new fans with every turn. Also Read: Alycia Debnam-Carey on ‘Dramatic Shift’ to ‘Fear the Walking Dead’ From ‘The 100': I Have No Weapons, No Power! To pull focus from a tour-de-force Taraji P. Henson performance is not easy, but Smollett did just that, and made Jamal one of the standout characters among a cast full of them. She was already one of Bollywood's biggest stars, but American audiences embraced Priyanka Chopra, who broke barriers by becoming the first Indian actress to lead a network show. The Georgia-born actor has mostly appeared in theater until now, but says his role in the Tina Fey-created series has caused people to stop him on the street and sing to him. We're sure the Emmy nomination didn't hurt, either. Ruby Rose, "Orange Is the New Black"
The Australian stunner turned heads when she showed up in Litchfield Penitentary on Season 3 of the Netflix hit. Piper's love life was already complicated, and Rose's Stella certainly didn't make things any easier. From a former gang member to an Emmy-nominated actor all in the span of five years, Cabral has a more extraordinary success story than most. Ritter's been known to audiences for her comedic chops, but Marvel's latest superhero showed off a much darker, more serious side. The Netflix Marvel cinematic universe is off to a very strong start with Ritter and Cox leading the way. James Corden, "The Late Late Show"
Corden already feels so at home on his CBS late night talk show, it's hard to believe he took over from Craig Ferguson eight months ago. How did we live before Carpool Karaoke? "Fresh Off that Boat" not only gave audiences the first Asian family sitcom in 20 years, it also gave them Constance Wu, who brought charisma and sass to more than elevate the role of Jessica Huang, the coolest Asian mom ever.